Attached to the Frank Lloyd Wright-inspired Monona Terrace Community and Convention Center by climate-controlled skywalk, the award-winning Hilton Madison Monona Terrace hotel is located in the heart of downtown Madison overlooking Lake Monona. Wake up in an elegant guest room to enjoy views of the Wisconsin State Capitol or Lake Monona. All guest rooms include a refrigerator and feature one king-sized bed or two double beds. For your convenience, in-room internet access is complimentary in all guest rooms. The Capitol Chophouse serves lunch Monday-Friday and dinner Monday-Saturday, featuring 28-day aged beef and local ingredients to create a memorable dining experience. The Breakfast by Hilton buffet is available daily in the Olive lounge, featuring Starbucks® coffee. The lounge is a great place to catch up with friends and enjoy a cocktail and a light snack. Recreational amenities at the hotel include a heated indoor pool, exercise room with modern equipment and direct access to the Lake Monona walking trail. 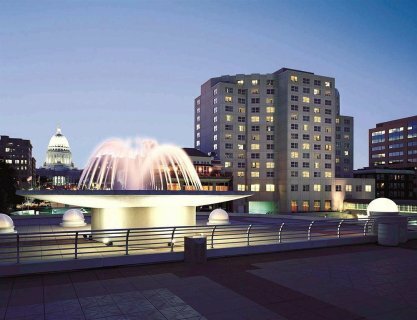 Explore all that downtown Madison has to offer just a few blocks from the Hilton Madison Monona Terrace hotel. The hotel is only blocks from Wisconsin State Capitol and the University of Wisconsin campus and hospitals. Camp Randall and the Kohl center are also nearby if you are in town to watch a University of Wisconsin Badger sporting event. Geek.Kon is an anime, science fiction, and gaming convention in Madison, Wisconsin, United States.